To ensure that everyone can receive effective professional garage door assistance, we provide fast and reliable emergency services. Each and every problem that requires urgent resolution is an emergency. If you have lost your clicker or have a broken spring, the problem has to be resolved in the fastest possible manner so that the safety and security of the door system is restored. The provided emergency assistance can be in the form of repair or replacement. We take all necessary measures to resolve the issue at hand and to prevent future problems. In case of a serious problem whose resolution cannot be delayed, you need to stay calm and dial our number. We will take over from there and make your electric garage door perfect once again. Our customer support specialists are professionally trained and work in the fastest possible manner to collect the required information from you and to allocate one of our emergency garage door repair teams to your address. Our crew will be with you sooner than you think. You can have complete peace of mind about the effectiveness of our emergency assistance. We, at Garage Door Repair Hopkins, resolve even the most complex of issues on the spot. All of our mobile crews consist of expert technicians with long-term experience and excellent practical skills. We keep up to date with the trends in our industry to ensure that we will be able to fix the latest glass door from Amarr and the most recent Craftsman or LiftMaster door opener. We have a full range of spare parts in our warehouse and this enables us to provide immediate replacement of broken and severely damaged components. We provide the perfect spring and cable replacement and broken garage track repair. When our mobile team comes to your place, you will receive a new part which has exactly the same specs as the original one. We provide complete replacement and all necessary adjustments. We always run a test to confirm that everything is fine before we leave. It is a mistake to underestimate the urgency of security problems. 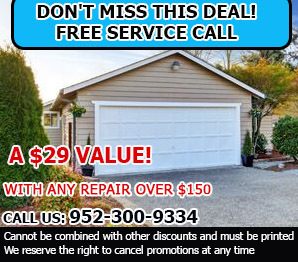 We are readily available to provide garage door windows replacement and lock repair. You can count on us to replace a lost or broken remote. Even if you have the latest Genie Intellicode clicker, we will come up with the perfect replacement unit. Discover the great deals we have to offer and watch out for updates!